Today may be Election Day, but as the votes come in for Congress many people will be heading for stores or staying home and ordering on Amazon. That’s because Toy Story 3 is being released today on DVD and Blu-ray. Toy Story 3 is the highest grossing animated film of all time, earning over a billion dollars at the box office worldwide. Pixar will also be in the Oscar running once again for this latest effort. 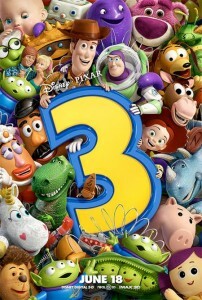 Sequels don’t usually outperform their predecessors, but Toy Story 3 did so both at the box office as well as critically. All this with stiff competition from Pixar’s first real challenge to the animation mantel by Dreamworks’ How To Train Your Dragon, released earlier the same year. Toy Story 3 tells the story of Woody, Buzz Lightyear and the rest of Andy’s toys as they once again face separation from Andy as he prepares for college. The film is packed full of action, humor, and heart.